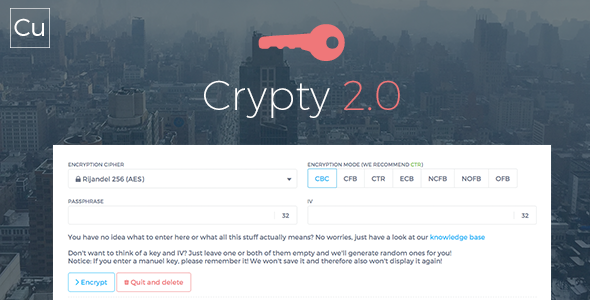 Crypty 2.0 - CODELISTPRO | Free Premium Scripts, Plugins, Apps Source Code. In the last few years encryption is a topic which rapidly came to mind to almost all site owners on the web. Nowadays end users worry about their data security as well and want their data to be safe and secure. Crypty offers you the ability to host a reliable and secure script which allows end users to encrypt their sensible data and to protect it against attacks and spying. On the one hand Crypty focuses on an easy user experience – no encryption knowledge is required at all thanks to an easy express encryption mode which automatically sets all encryption parameters and generates a very secure passphrase for encrypted files.